1. A person on board a vessel lost during a sea voyage, or an aeroplane which is missing, who has not been heard of for [two] years since the loss of the vessel or aeroplane. 2. A person in the armed forces who has taken part in a war, and has been missing for [two] years. 3. A person who has been in danger of death under other circumstances and his existence has not been known for [two] years. In a real sense, there are three parties to every civil marriage; two willing spouses and an approving State. On marriage, the parties assume new relations to each other and the State touching nearly on every aspect of life and death. The consequences of an invalid marriage to the parties, to innocent parties and to society, are so serious that the law may well take means calculated to ensure the procurement of the most positive evidence of death of the first spouse or of the presumptive death of the absent spouse after the lapse of the period provided for under the law. One such means is the requirement of the declaration by a competent court of the presumptive death of an absent spouse as proof that the present spouse contracts a subsequent marriage on a well-grounded belief of the death of the first spouse. Indeed, “men readily believe what they wish to be true,” is a maxim of the old jurists. To sustain a second marriage and to vacate a first because one of the parties believed the other to be dead would make the existence of the marital relation determinable, not by certain extrinsic facts, easily capable of forensic ascertainment and proof, but by the subjective condition of individuals. Only with such proof can marriage be treated as so dissolved as to permit second marriages. Thus, Article 349 of the Revised Penal Code has made the dissolution of marriage dependent not only upon the personal belief of parties, but upon certain objective facts easily capable of accurate judicial cognizance, namely, a judgment of the presumptive death of the absent spouse. A sworn statement of the fact and circumstances of reappearance shall be recorded in the civil registry of the residence of the parties to the subsequent marriage at the instance of any interested person, with due notice to the spouses of the subsequent marriage and without prejudice to the fact of reappearance being judicially determined in case such fact is disputed. So, is a judicial declaration of presumptive death better than seeking an annulment or a declaration of nullity of the second marriage? There are no hard and fast rules. Suffice it to state that “the automatic termination of the second marriage upon the reappearance of the absent or missing spouse is a risk that the paties to said marriage knew they were taking when they entered into such marriage, so that if it does happen, they have no reason to complain” (Justice Alicia Sempio-Diy, Handbook on the Family Code of the Philippines). Seemingly, the remedy available is for the spouse to seek annulment of her marriage with the presumed dead spouse. If granted, the reappearance of the latter spouse will not anyway affect the subsequent marriage contracted. That is following Art. 42 of the Family Code. I am in quandary though. What if both spouses had each other declared presumed dead for them to be able to contract subsequent marriage? Is it not that this provision opens up possibility of abuse and a less expensive and speedier remedy? It indeed, encourages collusion between the parties! That’s a very good point you raised, Prosec. Indeed, it allows a scenario wherein both spouses will collude. Still, this is not a guarantee that no one will subsequently question the “fact” of disappearance, considering that Art. 42 is wide open for interpretation, particularly the provision on “any interested person” who can file an affidavit attesting to the fact of reappearance. Ibang kaso rin s akin atty. May ka live in po ako almost 9yrs. Kaming nagsama.. Hindi kami nakasal kasi may asawa xa pero tagal na clang hiwalay. Hanggang sa ilang taon kami nagsama nagnegosyo kami ng dahil sa pinaghirapan namin nkabili kami ng mga apliances at motor..dahil po sa may sakit xa, namatay xa ng wla kaming anak..
Ngayon po, ang mga magulang ng kinakasama ko ay kinuha lahat ang mga appliances at ang motor na ni isang kusing hindi cla nagbigay para pambili, pinaghirapan namin un.. Kasi rason nila wla naman dw kaming anak tapos hindi kami kasal.. Ano po bang dapat kung gawin kung babawiin ko sa kanila lahat na kinuha nila? Salamat po sa tulong..
Atty Jek, personal examination of the respondent or the absent spouse is not a sine qua non for the declaration of nullity of marriage based on psychological incapacity. You may refer to Marcos vs. Marcos and related cases. Hope this helps. I was just wondering if annulment is the proper remedy under Philippine law. Annulment presupposes that the marriage was invalid from the start by reason of psychological incapacity. A declaration that the absent spouse was presumptively dead doesn’t seem to constitute psychological incapacity unless his or her disappearance was a result of the alleged psychological incapacity. In terms of presenting the evidence before the court, e.g. a psychiatrist, how can the psychiatrist testify that a person is psychologically incapacitated when the expert witness has not observed the person because he or she is nowhere to be found? I dont really know if you could answers this question of mine but i will just try. When i was still there in the Philippines, i went to the NSO office so many times to check if i do have a marriage record but i didnt get anything that says that i was married even i checked it in different spelling. So now my ex-husband got a record that says i was married before i just wondering why he got it. In fact, i got my Proof of Singleness thats why we got married in the Philippines last 2004. in short, he used my past as his ground for annulment. Atty, i dont really know what to do cause all my papers are original from NSO and why they didnt give me a copy that i was married before, its hurts me so much i think its very unfair cause now im so confused i dont know what to do. I dont know who’s fault it was, im thinking it was NSO’s faults because why they didnt give me a record that i was married before i entered into another marriage. But now why they have papers when my ex-husband checked my record at the NSO? hoping your reply soon, thanks and God bless. Eiruj, please check the article on Annulment, Divorce and Legal Separation Q&A. Check Q&A No. 7. It basically says that the existence of marriage is not proved solely by the marriage certificate. Someone who got married knows of such fact. Good luck. I just want to consult you on legal matters about separation or annulment. I am a single mother of two. My kids are in the Philippines and I am here in Canada. I got married in 1993(a month before i gave birth to our first child) and he left us (me and kids) after i gave birth to my second child. That was just a year after we got married. But prior to that, he wasnt coming home when I was pregnant with the 2nd baby. I haven’t seen him since then neither talked to him on the phone. In other words, I don’t know his whereabouts. Right now, my papers are in the process for the permanent residency in Canada. The problem is, they are asking me to give them a proof of annulment, legal separation or a divorce paper since I stated in my application that I am separated. Would it be possible to get an annulment done without going through court trials? If not, then what advice could you give me to get a quick proof of separation? I am separated (illegally) for 12 years now. Is it true that the marriage is automatically annuled now? I am a 55 year old European expatriate living and enjoying generally here in the Cebu. After living together with a woman and had a child for five years, she filed for presumptive death for her former husband who left her some 20 years ago, while she was pregnant. On the basis of this presumptive death we married a year ago. After marrige her attitude changed to the worst. She is permanently blaming me with adultery ( how could she proof?) and making my life miserable. She likes to treat me like her personal property which I cannot accept. I married her on the ground of giving my son a legal status and enable her later to take over my pension claim. Now i found out her husband of 57 years age might still living in Manila. How do I have to proof. her former (Filipino ) husband will definitely not show up by himself as he is fearing repressions from her family. I want to get out of that because I am afraid she is working very hard on an adultery case against me. My wife left me since 1984 and from that time on I don’t have any idea where she was except that maybe she could still be somewhere in Mindanao, her hometown. I didn’t follow her at that time because I’m not interested in taking her back. I didn’t take time correcting my status because I did not intend to remarry again until I met this special someone. Now, I planned to have my previous marriage annulled by filing presumptive death of my absent spouse. Is this the right approach and what are the chances that I’ll be granted ? How long does this process take? Macel, while I can’t go into the details of your case, I could say that there’s no such thing as having an annulment “without going through a court trial” or an automatic annulment. There are 2 kinds of separation – de facto and de jure. De facto means that you’re just separated as a fact, without any court order (which is the de jure…also known as legal separation). Good luck. John, I’m sorry to hear about your predicament. 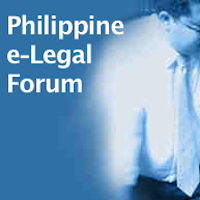 You may have noticed that legal advice is not given in this Forum. I don’t want to keep on repeating that, but I have to in order not to offend many members of the Forum. Of course, I could think of remedies that may apply to your situation (as in the other members), but I believe that this is something that should be discussed with your lawyer. I strongly suggest you both work it out. If not, you probably should see your lawyer. Deesian, I believe I already answered you questions somewhere. If I haven’t given any answer, please let me know. My girlfriend’s husband in Philippines left her 16 years ago and has not been in communication with her or their daughter during that whole time. If a court grants a Presumptive Death Petition and we move to the USA and get married, what happens if 1st husband shows up again? If she is already US citizen then what? Mag ask po ako ano pwede gawen. I was married to a Japanese last 2009 and no communication from him since 2011. wala na din po ako balita sa kanya totally. Since kinasal kme d napo xa bumalik sa pinas at on off ang tawag nya until 2011, huling balita ko my sakit un at tas totally wala napo after nun. My BF napo ako ngaun at gusto ko po namen mgpakasal, kaso dahil married status ko d po namen magawa. my now fiance finalized his divorce here in America, he and his wife got married in civil court in the philippines. here in America they are divorced and i know that there in philippines, they are still married. for almost 5 years now, they have been seperated with different addresses and dont contact each other. if information is provided that they were no longer living together for 4 years plus, could an annulment be persude? thanks you.